2010 saw the beginning of a new gallery collective in cardiff which features the most contemporary and progressive art and design in the capital. 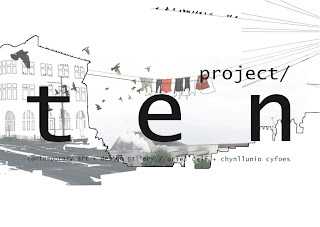 Led by cardiff-born gallerist-curator, Cat Gardiner, project/ten operates as a web-based and pop-up gallery, promoting and supporting high calibre contemporary art and design in temporary locations. Each artist and designer has a link with wales, and each stand strong in his own right. a new concept, and cardiff’s first design-focused gallery, project/ten builds a network of inter-disciplinary creatives as a platform for collaboration, dialogue and exposure, all in the name of progress. project/ten's first show - spring #1 - was as Cardiff Arts Institute and featured work from artists Rob Stevens, Rhian Thomas, Osian Batyka Williams, Justin Bartlett, Tom Kitchen, Shaphan Cole, Ruth McLees, Jen Oakes, Huw Aaron and myself. In the meantime, the big fuss arts festival is happening at milgi, City road, Cardiff, over the first may bank holiday. project/ten will be making an appearance with a feature wall so head down and support what's going on. Finally a big thank you to Cat and Andy at project/ten for involving me in such an exciting collective! Doing a super job guys! !